Ceiling texture adds a subtle design element and conceals small drywall taping discrepancies. A stomp texture is made by rolling thinned joint compound on the ceiling, and then tamping the wet texture with a slap brush. Once you paint the ceiling, however, it's nearly impossible to repair small areas of texture without creating a "patched" look. Fortunately, it's not difficult to remove the old texture, but it's a dusty job if you sand it off and a messy job if you scrape it off. Sanding off ceiling texture generates lots of dust. Sand the old texture with a drywall power sander that has an attached dust collection bag. Even with the bag, removing the texture will disperse clouds of drywall dust in the room. Move the power sander from side to side, sanding in swaths about 4 feet wide, from one end of the ceiling to the other, and then back again. After a few seconds, you may not be able to see the ceiling clearly due to the dust in the air. Change or empty the dust collection bag frequently. The bag holds a small amount of drywall dust generated from sanding newly taped seams, so the large amount of dust generated by sanding a textured ceiling will fill the bag quickly. Let the dust settle after you make a sanding pass over the entire ceiling, and re-sand areas you might have missed. Fill a pump sprayer with warm water, and spray a 3-foot area, just enough to dampen the ceiling. The texture will quickly absorb the water. Wait five minutes, and then use the pole scraper to see if the compound is loose. Depending upon the thickness of the texture and the type of paint on the ceiling, the old texture might come right off -- or it might not budge. Spray the section again, and wait five more minutes before testing the texture. Once the texture begins to come away easily, follow the same procedure of wetting and scraping on the rest of the ceiling. 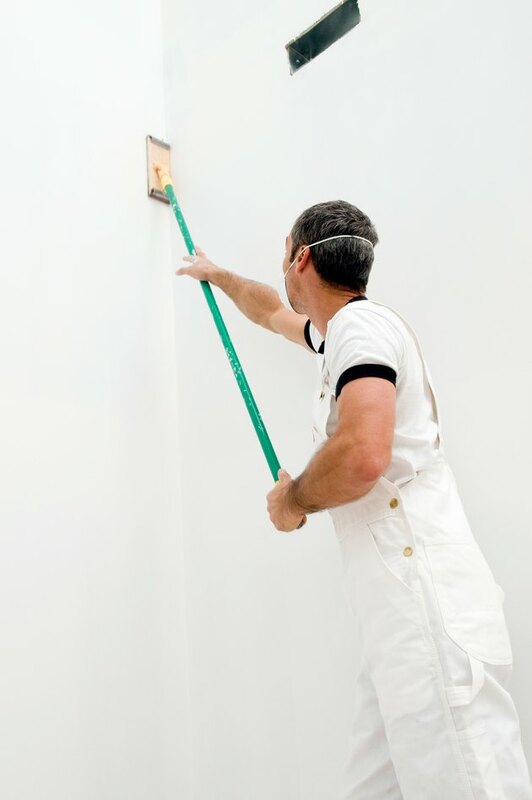 If the texture resists scraping after wetting it thoroughly, you'll have to sand it off. Let the ceiling dry completely, and sand it with a drywall sander before applying new texture.